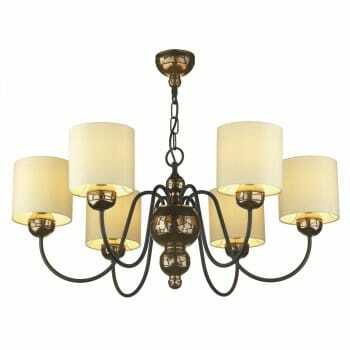 David Hunt Lighting British made Garbo 6 light ceiling fitting features elegant arms in a bronze finish complete with cream cylindrical shades. The product code for this David Hunt ceiling fitting is GAR0615. Height adjustable at the point of installation and comes supplied with 50cm of chain and cable. This stunning design will add a classic look to any room within your home and the combination of bronze and cream shades completes the elegant look. An alternative pewter finish is also available along with shades that feature a black string effect or black fabric shades with a silver internal lining. These may all be ordered from our website or by contacting a member of our sales team.